This Mormon Tabernacle Choir Christmas concert was brought to you by the number 633. That—more or less—is how many singers, dancers, instrumentalists, conductors and guest stars were onstage in the LDS Conference Center on Friday night in the second of four sold-out performances of the seasonal spectacular. Pre-performance chatter among the audience before a Mormon Tabernacle Choir Christmas concert isn't out of the ordinary, but this time it was different. With young boys in ties and sweater vests and girls in their Christmas dresses fidgeting and sitting on the edge of their seats waiting for the performance to begin, there was something different in the air. 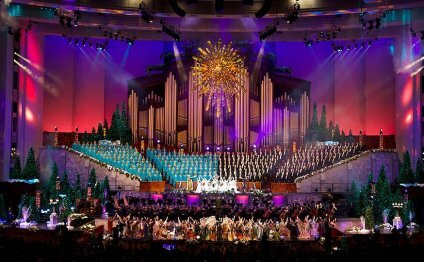 The Mormon Tabernacle Choir and Orchestra and Temple Square are entertaining children and adults who are young at heart for their annual Christmas concert this year. Guest artists Broadway star Santino Fontana and the “Sesame Street” Muppets™ have joined the choir for several concerts, including performances in the Conference Center in Salt Lake City from December 11-13, 2014. "Sesame Street" came to Salt Lake City’s North Temple Street this week as nine Muppets joined the Mormon Tabernacle Choir and singer Santino Fontana in the choir’s popular Christmas concerts. The first of three evening performances took place Thursday; the event also includes a Sunday-morning broadcast of "Music and the Spoken Word." "Sesame Street" fans know there is nothing Count von Count loves more than counting, so who better to count down the days until the Mormon Tabernacle Christmas concert than children’s favorite vampire? Mormon Tabernacle Choir representatives met with Cookie Monster, Elmo and Abby from "Sesame Street" on Friday at the LDS Conference Center to talk about their upcoming holiday show with special guest Santino Fontana. The Muppets of Sesame Street are teaming with the Mormon Tabernacle Choir for its annual Christmas Concert. It's a thrill for the Choir, spectators and this year's guest artist Santino Fontana.